DivaDevotee's first Male profile; what a joyous and momentous day! I'm not sure how frequent these "male profiles" will be, especially considering the list of female pending profiles, but I'll try to get one out at least once a month. So, who better to start with than the legend that is Michael Jackson. 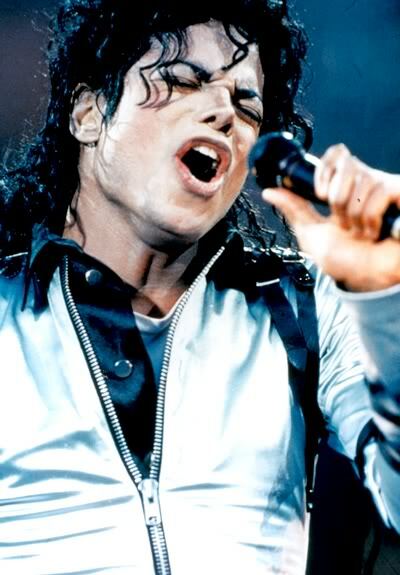 Vocal Pluses: Michael Jackson's voice was predominately light and agile with a nimble, rhythmic dexterity that allowed for complex vocal runs, as well as allowing it to mimic instruments- such as drums- or employ trademark grunts and exclamations that were controlled and achieved via proper technique. The voice also had the strength and stamina to hold notes for lengths of time, without wavering in pitch, and the ability to emote the meaning of the lyrics exceptionally. The low range was the heaviest part of the voice, and was surprisingly dark when compared to the higher parts of the modal range, in which he usually sang. As the voice passed into the midrange it began to lighten and brighten significantly. The chest voice had an elasticity and flexibility that allowed for it to stretch, without much impact on the tone, up to the fifth octave. The belting range had a number of timbres, being either bright, light and smooth, or coarser, slightly heavier and with an edge-see They don't care about us . The falsetto was solid, warm and more resonate than many other male singers, though it was also capable of a softer timbre if so required. Comfortable in this part of the range, Michael Jackson could sing effortlessly here holding notes, or hitting complex staccato notes- see Butterfies. Unique and immediately recognisable voice that harmonised with itself brilliantly to create luscious and iconic layered vocals. Vocal Negatives: Michael Jackson's tone could be considered thin and lacking in resonance, particularly in the mid-to high part of the modal register, when compared to other male singers. It should be noted that many fans consider this to be a unique, and positive, feature of the voice. Michael Jackson warming up with vocal coach Seth Riggs in 1994. I think what is interesting about Michael Jackson is I have heard very good singers attempt to duplicate his work but fail Miserably. You may have a singer who is technically a better singer in regards to range who seems unable to capture the magic of a Michael Jackson recording. He was a good singer and amazing entertainer/performer. I personally don't like his voice, specially when he sang in high registers. Anyway, I love the fact that you're doing male profiles and I hope the next one will be my favorite Mr. Freddy Mercury and then someone alive Justin Timberlake or Usher. WOW, male vocal profile!!! This is an epic day in history! Love it! Interestingly he worked with Seth Riggs - you can read about it in Quincy Jones's autobiography. Seth brought him in for the Thriller album to help Michael's range get wider...Quincy claims Seth could work with artists and get another 3 or 4 notes out of them easily! If you carry on with the guys, can we have Stevie Wonder next please? That man can do things with his voice that I can't even understand! It is the last note in this video, however it is incorrectly called an F6. "It should be noted that many fans consider this to be a unique, and positive, feature of the voice. " i was wondering, are you venturing into male vocals? if you are, are u gna post more male vocals here? Thx a lot DD! What a great site I've just dicovered! May I suggest you did one abt Thom Yorke? The guy has quite a range, not to mention the ambient emotion he conveys. Methinks he's earned a place as male diva! Hi DD, I was wondering if you know any countretenor in non-classical music? Isn't a high tenor a countertenor? Michael Jackson is my favorite vocalist. From when he was a child to an adult. So many deliveries, ranges, sounds. He's the greatest singer i've ever heard. Indeed. Countertenors include high tenors with raised ranges and tessituras (tenor altinos/haute contres) as well as the pure falsettists. Yeah but high tenors exist as well. Those that aren't quite countertenors but sustain a consistently higher tessitura than your average tenor. Michael's one of these. And Chris Colfer is a terrible singer, haha. And which am I? LOL. But for the record, I think it better to just call him a high tenor. Countertenors are really a heterogeneous classification that includes tenors and baritones capable of singing female repertoire either with a full head voice or reinforced falsetto. High tenor is technically the appropriate classification as "countertenor" refers more to a vocal part although many people use it informally to refer to a high tenor. Ugh, can't agree more. I hate Chris's voice. He has a very unique sound, but in a different way from even me. Colfer is one of those guys you either like or you don't. Based on his vocal placements, he sounds like his lower modal voice and countertenor extension are extremely different. I think he has trained his falsetto so much that it is really his comfort zone and signature sound. For those who dislike that sort of timbre, you'll hate him. But some people like such interesting falsetto placement, especially Glee girls. Go bang your head on the wall. I found this fascinating. Thank you for your video and notes. Great to see all the examples throughout Invincible, and to hear MJ doing his vocal warmups. Very correct info, love it! MJ was a beast, some people don't even realize it. Yes Elvis was a great singer , I love fools rush in, however I was taking about the King of Pop. You are right, he is the best selling solo artist ever, so the title of King of music is the best fitting for him, not just Rock and Roll. Uhm, salesnumbers were not my criteria here. Just talking about that title ' The King' and who is originally and most commonly thought of when people hear it in musical context. It's not a reference of sales, people just typically refer to Elvis as "The King" and Michael as "The King of Pop"
Look it up dude. I wasn't talking who in my opinion should have that nick name but who actually did. And Berry is more known for songwriting and guitar playing. This blog is about vocalists. You can't compare them on equal basis. Seth Riggs has stated that MJ has been incorrectly described as having a falsetto voice. I don't know much about such technicalities. However I'd be interested in why his opinion, based on decades working with him, does not accord with yours in that regard. Michael Jackson's voice was like voice of angel.his talent was revealed when a singer child. Michael Jackson is the king of pop for ever. his repressive career spanned almost five decades, and he was continually at the forefront of popular music, being crowned as he is now, the undisputed king of pop. So he's been a high tenor. For sure. The key is to look at the tessituras and mixing zones. Most of MJ's songs are well above the baritone tessitura (F2-F4). In fact, most of his songs fit the high tenor schema (F3-F5), an octave above. Also his chest register carried on quite high through the mixes past C5. His timbre was relatively high and bright and while many tenors can have nice lower registers their comfort zone is generally mid-register and above.